E - Rhamel Bratton, Huntington-11, sr.
E - Shamel Bratton, Huntington-11, sr.
L - Zach Gallo, Sayville-11, sr.
L - Peter Violante, Lewiston-Porter-6, sr.
L - Kyle Macey, Lansingburgh-2, sr.
L - Alex Greenberg, Harrison-1, sr.
QB - Coleman Flory, Corning East-4, sr.
RB - Rod Osborne, Ossining-1, sr.
RB - Mike Mayo, Roosevelt-8, sr.
RB/QB - Matt Ciraco, Harrison-1, sr.
RB - Alonzo Powell, Nyack-1, sr.
E - Jimmy Falasca, Harrison-1, sr.
L - Malik Crowl, Lawrence-8, sr.
L - James Rayhill, Grand Island-6, sr.
L - Chris Andrews, Syracuse Nottingham-3, sr.
LB - Anthony Polo, Wantagh-8, sr.
LB - Matt Moretto, Cornwall-9, sr.
LB - Billy O'Connor, Sayville-11, jr.
HB - Mike Perillo, Iroquois-6, sr.
HB - Cameron Flory, Corning East-4, sr.
HB - David Ahonen, Victor-5, sr.
HB - Brad Comfort, Corning east-4, sr.
E - Ryan Hantverk, Lynbrook-8, sr.
E - Mickey Mangieri, Fox Lane-1, sr.
L - David Skrip, Albion-6, jr.
L - Keith Norton, East Syracuse-Minoa-3, sr.
L - D.J. Laughlin-Pope, Corning East-4, sr.
QB - Zach Howell, Huntington-11, sr.
RB - Kyle Holmes, Burnt Hills-2, sr.
RB - Xavier Martin, Xaverian-NYC, sr.
RB - Antonio Aponte, Rochester Aquinas-5, sr.
RB/QB - Dave Boisture, Cornwall-9, jr.
L - Brian McNally, Cornwall-9, sr.
L - Nick Christman, Sweet Home-6, jr.
L - Jajuan Perez, Ossining-1, jr.
L - Paul Skarka, Burnt Hills-2. sr.
LB - Sergio Smith, Buffalo McKinley-6, sr.
LB - Alex Hamilton, Corning East-4, sr.
LB - Chris Sawyer, Lansingburgh-2, jr.
HB - Vinny Graham, Jamesville-DeWitt-3, sr.
HB - Kyle Crotty, Bethpage-8, sr.
HB - Ryan Schmidt, Whitesboro-3, sr.
K - Kyle Shevlin, Iroquois-6, sr.
E - Troy Walker, Long Island City-NYC, soph. E - Ryan Thon, Victor-5, sr.
L - Sean Fallon, Bishop Maginn-2, sr.
L - Kyle Gibas, Starpoint-6, sr.
L - Sean Kearney, Mohonasen-2, sr.
QB - Mike Mathews, Fox Lane-1, jr.
RB - Cameron Cotton, Fulton-3, jr.
RB/QB - Colan Shue, Indian River-10, sr.
RB - Kenny Youngs, Lansingburgh-2, jr.
RB - Curtis Dukes, Indian River-10, soph. RB - D.J. 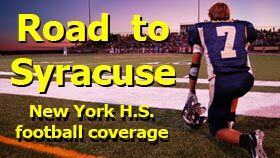 Moore, Burnt Hills-2, sr.
L - Adam Walsh, East Syracuse-Minoa-3, sr.
L - Joe Grassia, Mohonasen-2, sr.
L - Adam Kinney, Fulton-3, sr.
LB - Connor Flynn, Corning East-4, sr.
LB - Devin Worthington, Rochester Aquinas-5, soph. LB - Rakim Stubbs, Rochester Wilson-5, jr.
LB - Brett Miranda, Ossining-1, sr.
HB - Ben Batty, Burnt Hills-2, sr.
HB - Bryan DiSabato, Lawrence-8, sr.
HB - Vinnie Nicosia, Amsterdam-2, jr.
S - Ken Thomas, Ossining-1, sr.